The two best types of concrete screeds and why you should use them to. A concrete screed (or straight edge) is used to strike-off or level concrete. In all the years I've been in the concrete business (38 and counting as of writing this page) I've used a lot of different concrete screeds. I've used wooden 2x4's and 2x6's, magnesium 2x4 screeds, magnesium 3/4" x 4" screeds, vibratory screeds, and laser screeds. For what I do, residential & light commercial concrete floors, slabs, patios, driveways, pool decks and walkways, I think the 2 best screeds are the 2x4 magnesium (or aluminum) ones and the vibratory screeds. This is one of my favorite types of concrete screeds. In the picture we're using a 2" x 4" x 14' long concrete screed to level the concrete for this slab. We straight edge a lot of slabs this way, it's how we were taught. The 2x4 screeds come in lengths from 3' to 20'. You can buy them right from Amazon. Click here to take a look. We also use a vibratory screed to level slabs, it just depends on the size of the slab. There's a few things I look for when I'm using a screed that make my job easier. It's got to be lightweight, I like the magnesium or aluminum ones. It's got to be strong. I like the 2x4 type of straightedge, it doesn't flex like the thinner ones do. I have to be able to grip it comfortably. That's why I also like the 2" wide ones. The thinner ones make my hands cramp up more by having to squeeze them harder. Another thing I like about the 2x4 screed vs the thinner 3/4" ones is when I or we (my crew) straight edge concrete, we slightly tip the screed back so it runs more on the back edge of the board. Since it's 2" wide, the screed pulls the concrete and kind of smoothens it at the same time, making it easier to bull float. The thinner screed kind of tears the concrete as you pull it off, leaving a rougher surface to bull float. Something you wouldn't know unless you did it a lot. My other favorite type of concrete screed is a Vibra Screed (or vibrating screed). This kind of screed is a great tool to have for leveling floors and slabs. I only use it for bigger house, garage, and commercial floors. Anything 1000 sq. ft. or larger. Under this size we find it easier to just screed the floor by hand with the 2x4 screed. Although the vibra-screed is quite easy to operate, you need at least 1, preferably 2, good rakers behind you pulling and pushing the concrete in order to get a really flat floor. Check out my page about vibrating concrete screeds for more information. I also have a video of us in action on this page where I explain how to use one and get a really flat floor with it. 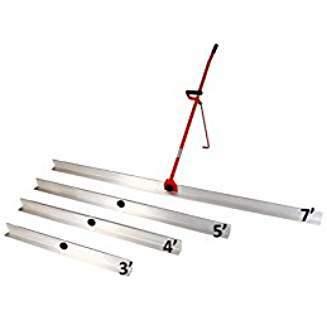 If you're looking to buy a vibrating screed, you can get a good one from Amazon, the Tomahawk vibrating screed, it comes with a 12' board and a Honda motor. An excellent screed in my opinion. Well, those are what I feel are the two best types of concrete screeds. The 2x4 screed for it's simplicity and easy learning curve. And the vibratory screed for a faster, easier way of screeding larger floors and slabs. EZ Screed makes a type of concrete screed you can use in the upright position. This is supposed to be a more ergonomic type of screeding tool. This type of screed would be good for sidewalks, patios, driveways, slabs, and floors. I personally haven't used this screed. 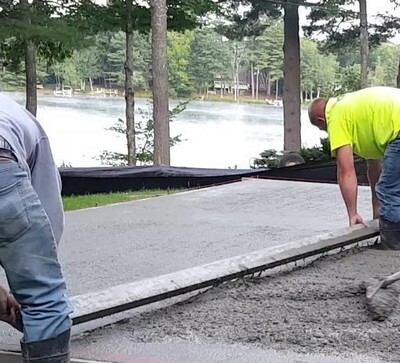 If you're just starting out and/or have issues bending over, you might want to consider this way of screeding concrete. You can find the EZ Screed also on Amazon. 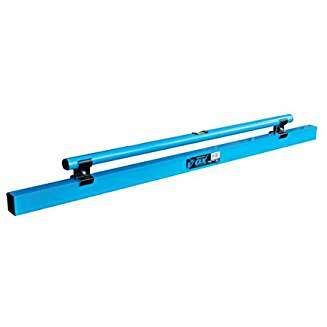 Ox Tools has a concrete screed / darby combo tool. It's lightweight, made of aluminum, and has a handle to grip it with. The front edge is square for screeding and the back edge is rounded for smoothing the concrete. It does have a built-in vial in the handle so you can check to see if you're level or not. It comes in 4, 6, and 8 foot lengths. If you like this type of screed/darby combo, you can check the current price on Amazon. As far as concrete hand screeds go, the two top ones on this page are what I recommend you have. If the other ones look interesting to you, go ahead and try them. Everyone has their own likes and dislikes. My company, Day's Concrete Floors, Inc. pours concrete just about every day. So we screed a lot of concrete. We've got a good system for screeding that's easy for us. That's why I recommend the two screeds above. They're easy to learn, easy to use, and produce good results (with a little experience). If you want to see some videos of us screeding concrete, subscribe to my youtube channel. I have some of us pouring concrete floors and slabs. Here's one showing How we pour a concrete floor.